Aberbargoed Grasslands is the first National Nature Reserve to be declared (in June 2012) within the boundaries of Caerphilly County Borough. Its existing SAC/SSSI designations speak of the importance and value of the wildlife habitats and species found there, but it is also important because it lies in the heart of one of the most deprived urban areas of Wales in which NNRs are under-represented. This NNR is managed by the Caerphilly County Borough Council with support from Natural Resources Wales (NRW). The nature reserve covers an area of just over 42 hectares and lies on a southwest-facing slope in the Rhymney Valley. Aberbargoed NNR supports a large area of semi-natural lowland grasslands of various types - habitats that are now rare both in Wales and in the rest of the UK. The reserve is also home to an important population of the Marsh Fritillary Butterfly (Euphydryas aurinia), a species that is becoming increasingly rare throughout the UK due to loss of suitable breeding habitat. From Merthyr Tydfil take the A465 Heads of the Valleys Road eastwards towards Abergavenny. Turn onto the A4048 heading southwards towards Tredegar. Once you reach Aberbargoed turn left into Heol Tir-y-Llan. Open all year round, access to the NNR is through the small housing estate and around the playing fields. There is no formal parking area for the NNR. There are tracks throughout the reserve, but they are not suitable for wheelchairs or prams. There is an information board at the entrance of the site. Aberbargoed Grasslands boasts its own purpose-built Education Centre situated at the north-eastern end of the reserve. This excellent facility has been set up in partnership with Dwr Cymru-Welsh Water, who own the land on which it is built. The Centre acts as a focal point for the nature reserve for both local residents and visitors. It also provides training facilities for teachers, and the schoolchildren in the area use it for educational purposes. There are pubs, shops, cafés and public toilets in the local town, and the NNR Education Centre also has public toilets. The types of lowland grasslands found at Aberbargoed are poorly represented in Wales, and the so-called neutral grasslands found within the reserve are the first in Wales to be judged as an 'outstanding example' of this type of habitat. Other complementary habitats are marshy grassland, acid flush, wet heath, scrub and woodland. A walk through this lovely place takes you through marshy grassland with plants such as Purple Moorgrass (Molinia caerulea), Devil's-bit Scabious (Succisa pratensis) - the food plant of the Marsh Fritillary Butterfly's larvae - and Sharp-flowered rush (Juncus acutiflorus), along with two wild orchid species: Heath Spotted-orchid (Dactylorhiza maculata) and Southern Marsh Orchid (Dactylorhiza praetermissa). In the drier areas bright patches of flowers light up the grass: Oxeye Daisy (Leucanthemum vulgarae), Common Knapweed (Centaurea nigra), Bird's-foot Trefoil (Lotus corniculatus) and Red Clover (Trifolium pratense) among them. It is the wealth of wildflowers and plants that make this such an excellent place for insects too. Apart from the Marsh Fritillary Butterfly there is are also populations of Small Pearl-bordered Fritillary butterflies and Chimney Sweeper moths on the reserve. 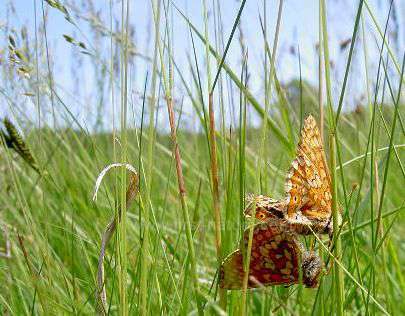 A management regime is being implemented at Aberbargoed Grasslands NNR to help conserve the Marsh Fritillary butterfly in particular. 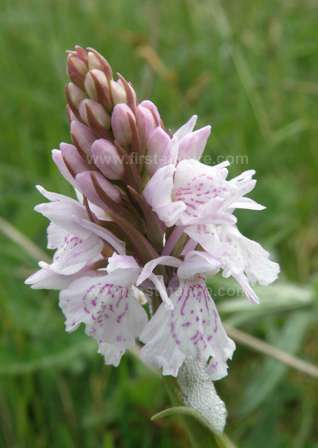 This species is in steep decline throughout Europe, and Aberbargoed is at the most easterly edge of its range in Wales. Apart from establishing a traditional grazing regime to help control the rank plant growth that otherwise would crowd out the special plants (including Devil's-bit Scabious), there is a work programme to clear bracken and scrub on the site in order to open up the fields and establish flight lines for the Marsh Fritillary butterflies.